George W. Bush's capacity to undermine international stability has multiplied a thousand-fold and continues to grow exponentially after the cute, cuddly, yet choleric President spawned a batch of mischievous clones early yesterday morning as a result of White House Chief of Staff Joshua Bolten feeding him after midnight. 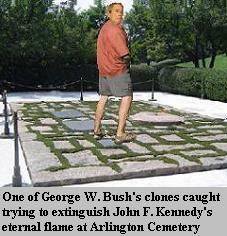 Reports arriving from all over the globe indicate that hundreds, if not thousands of impish versions of Bush are propagating across the world, irritating people and subverting diplomatic relations so profoundly that some experts are now predicting that nuclear armageddon could arrive as quickly as tonight or tomorrow, rather than months from now. In Iran, tensions between the United States and the Islamic republic have deteriorated severely in the past twenty-four hours after several Bush clones were apprehended attempting to sabotage a nuclear facility in an undisclosed location, while another dressed in nothing but a trenchcoat caused an uproar by flashing several female pedestrians on the streets of Tehran. Other Bush clones caused trouble in Europe, where one was seen wiping his rear end with a copy of the 1972 Anti-Ballistic Missile Treaty outside the Kremlin, and two others drove a riding lawn mower through the living room of Russian President Vladimir Putin's summer home, further exacerbating friction between the US and its Cold War enemy, while in France, locals were aghast to witness a laughing, mohawked Bush careening through the Louvre on a motorcycle, inflicting irreparable damage to dozens of priceless works of art. "Despite warnings from the Vice President and former Chief of Staff Andrew Card, Mr. Bolten made a mistake in judgement by giving into the President's request for a late snack Thursday night," spoke White House Press Secretary Tony Snow during an international media address meant to clarify the situation and mitigate its impact, "However, what's done is done, so there's little more to say than good luck and try not to get them wet, because that's how they reproduce." Mr. Snow's words did little to console Queen Elizabeth, who, after being startled by a rabble of George Bushes singing "God Save the Queen" in a menacing fashion at the front door of Buckingham Palace, tried to escape back to her bedroom only to find herself a victim of sabotage when the chairlift she uses to ascend the master staircase launched her shrieking into the London night. "More vexed, never have I been," huffed the Queen through a mouth full of broken teeth. Meanwhile, as the real President Bush remains conspicuously absent from the public eye, his devilish spawn are running amuck across the homeland, chipping away at his 32% approval rating as they torment the populace in movie theaters, bars, shopping centers and street corners. "The President pinned my baby to a dartboard and used him as target practice," complained a mother from Tulsa, Oklahoma, "I'm telling you, if that man could run again I'd think twice about voting for him a third time."